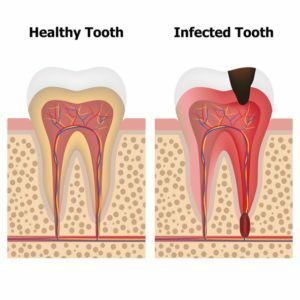 What Causes Cavities to Form? Despite what you may have perceived as a child, cavities are not the direct eating of the tooth by bacteria or sugar. In fact, your Wilsonville family dentist may surprise some by saying each alone has little direct affect on the teeth. However, when combined, they create the deadly cavity forming substance – acid! When bacteria housed in the plaque left on our teeth break down sugars, they produce acid. This attacks our tooth enamel by removing vital minerals from the enamel that weaken the tooth structure. Over time, the weakened area collapses, causing a cavity to develop. The formation of cavities varies from person to person, depending on a variety of different factors that I would like to discuss with you. Even the healthiest mouth contains millions, possibly even billions (depending on the last time you brushed) of bacterial strands. However, we all get different strains of bacteria. All bacteria produce acids in the process of breaking down the food and sugars consumed. While most of this oral bacteria is harmless, some of these strains are extremely “cariogenic,” or cavity causing. So how do you get your oral bacteria? This occurs at a very young age. What occurs is process called “seeding” during which your oral cavity becomes populated with bacteria from your environment. One of the largest environmental factors is family. When people say, “my mom had bad teeth, and I got her teeth,” there is some truth to that. They likely got her bacteria, which was probably more cariogenic than dad’s bacteria. This means that parents should keep in mind that you can directly pass bacteria to your kids when you start kissing, feeding, and caring for your little ones. This makes it important that parents maintain their oral health when caring for their children. By reducing the bacterial load you can pass on to your child, you reduce the risk of permanently damaging his or her long-term oral health. Of course, if bacteria was the only cause of cavities, dental fillings may already be a thing of the past. The foods and drinks we consume directly impact the health of our teeth. In addition to acid-producing oral bacteria that creates cavities, any foods with a low pH have a demineralizing/cavity forming effect on our teeth, especially when consumed over long periods of time. For example, if you have a morning habit of sipping on soda, coffee, or energy drinks during your daily commute, you are inadvertently harming your oral health. Foods with a low pH are better consumed in short intervals. Don’t get me wrong, I sip my coffee all morning. Most of us do! But we need to understand the inherent risks in these types of habits and how a change could yield some benefits. The other aspect of diet that is important goes along with what oral bacteria each person has. Diets higher in refined sugars supply more nutrients for oral bacteria to break down into acid. Foods like soda, candy, crackers, breads, cookies, and other processed foods provide far more fuel for oral bacteria when compared to items low in sugar such as fresh fruits, vegetables, and whole grains. If you have a tendency to develop cavities, your mouth probably contains more strains of harmful cavity-causing bacteria than you’d probably like. You must become even more aware of your diet and how you consume foods if you want to improve your long-term oral health. There are three more factors in what causes cavities that I’ll cover in our next post. But for now, consider these first two, and please feel free to ask any questions you may have during your next visit to our Wilsonville family dentist office. See you soon!